Karma's is one of my favourite restaurants in the city and best for authentic Tibetan, Malaysian and Southeast Asian cuisine. I love it for its vibrant flavours and unpretentious atmosphere. Its walls are uncluttered, the tables free of unnecessary cutlery or condiments, the air calm and peaceful, and the food sings. Every bite fills your mouth with tastes that burst with authentic flavours of lands far away. 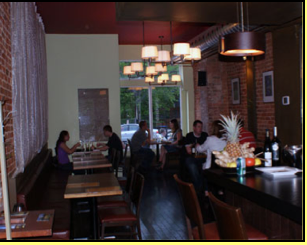 In the heart of Peterborough’s restaurant district, Karma's has been a fixture for many years and the most impressive quality about this establishment is the consistency of its food. One of the biggest compliments owner Karma has received in the history of the restaurant was bestowed upon him during his appearance on Restaurant Makeover—the celebrity chef on the show didn't change a single item on the menu, and in fact, stated that Karma actually taught him a thing or two. We go to Karma’s a few times a month. Tonight we bring a friend from out of town. 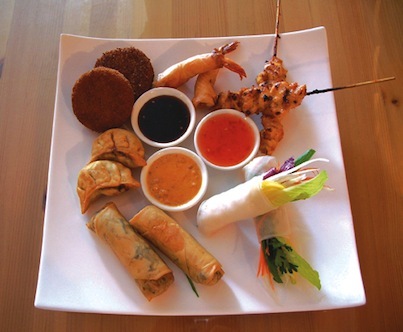 As always, we dive into Karma’s Platter—a platter of each of the appetizers. We all get to savour chicken satay with its succulent grilled chicken and a tangy, mildly spicy peanut sauce, light and crispy Thai spring rolls stuffed with chicken, glass noodles, cabbage, cloud ear mushrooms, cilantro and green onion that are thankfully in no way greasy. We also sample fried momos—dumplings filled with ground steak, cilantro and onions, cold rice paper salad rolls overflowing with fresh green mango, papaya and herbs, lemon garlic shrimp wraps with a sweet chili sauce, Bami–Hapjes—noodle and vegetable patties and Nasi–Hapjes, which are rice and vegetable patties served with a smooth tamarind sauce. Each dish offers a distinct signature and each mouthful is alive with texture and freshness. Karma's specializes in exotic noodle dishes, offering a wide array of tastes to suite any craving: sweet, spicy, tangy, citrusy, smooth, and crunchy heaped on plates garnished with fresh vegetables. Or treat your taste buds to one of Karma's delicate curries served with fragrant steamed rice. All the food is fresh, healthy and beautifully presented, and we marvel at the impact it has on our soul as the tastes linger on our palette and in our memories for days. As I write this review, I am hungry all over again and long for our next visit to Karma's Cafe.